My nearly-finished crazy quilt has been on my mind lately, and to finish up I need a few more embellishments. I decided to look for some tea-themed goodies on Etsy and came across the most delightful seller, a Judith Brainerd of Olympia, Washington, whose lace appliques are gorgeous and quite, quite affordable! 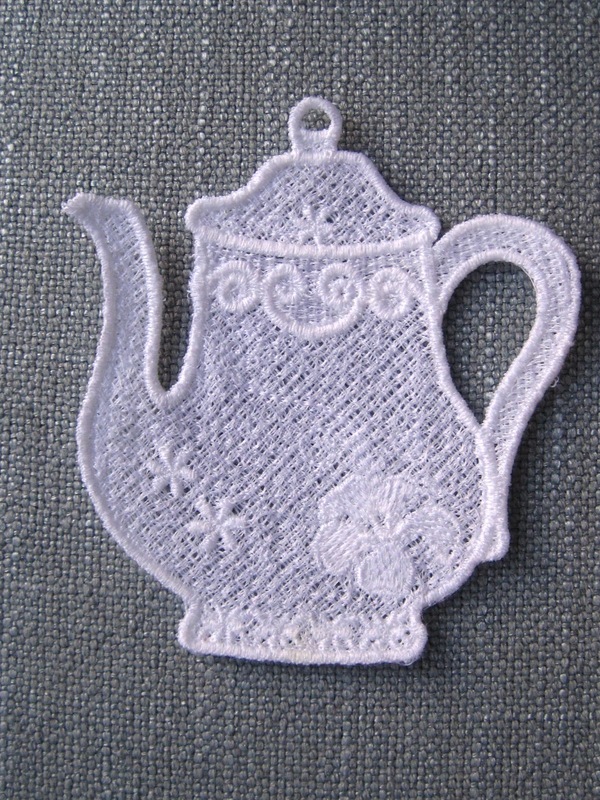 This teapot, which like all her laces she makes herself on her sewing machine one piece at a time, is 3-1/2 x 3-1/4 inches. The teacup (with cute teabag!) is 3-1/4 x 2-3/4 inches. Each piece is just $1.99, which I think is a terrific price! I'm planning to use my appliques on a crazy quilt, and I plan to tea-dye them a soft ivory. But wouldn't these also be great framed individually, or stitched on a small pillow, or used in scrapbooking or embellishing a denim shirt, or maybe even canvas tennis shoes? 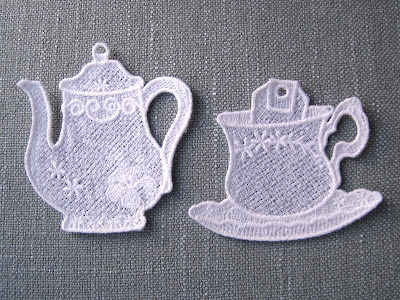 I can think of lots of uses for these lace appliques. 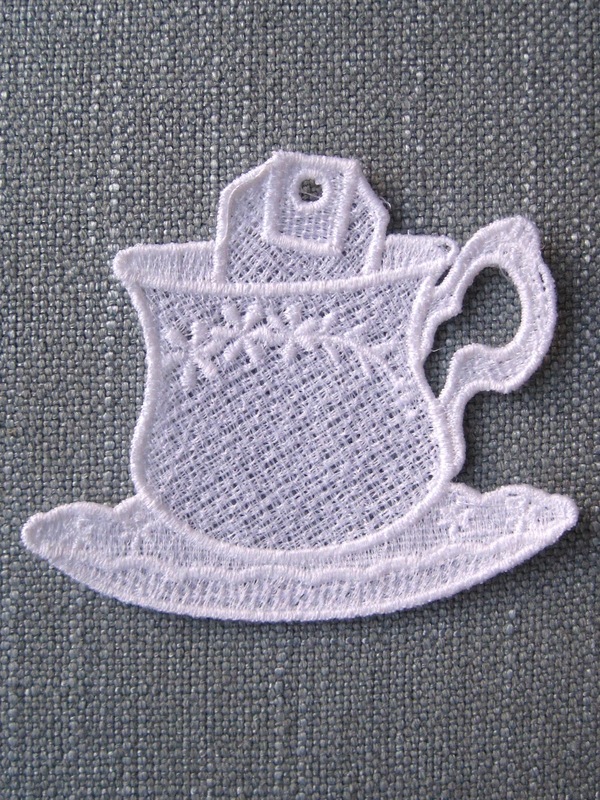 If you want some yourself, go here to visit Judith's shop on Etsy. On my most recent order from Harney & Sons, they included some new samples of teabags that I was happy--as always--to try! First up was the Tilleul Mint, a caffeine-free herbal blend with mint. When I opened the packet I got a nice whiff of mint, but the flavor wasn't as minty as I had hoped. Harney says the blend features "the crushed leaves and flowers from a linden tree with peppermint." It reminded me of a weak chamomile blend of herbal tea, so this wasn't a real favorite. Next, the Verveine Lemon Verbena was another caffeine-free herbal, billed on the packet as a "lemony herbal infusion." Well, I didn't much care for this one either, which is a surprise because I have enjoyed almost every Harney tea I've ever tried. This one also had a rather weak taste, and the lemon flavor was simply too, too subtle. ... and it looks just like Dragon Pearl Jasmine tea because, um, it is. It had the lovely floral scent and taste I've long enjoyed, and this one was a real winner! 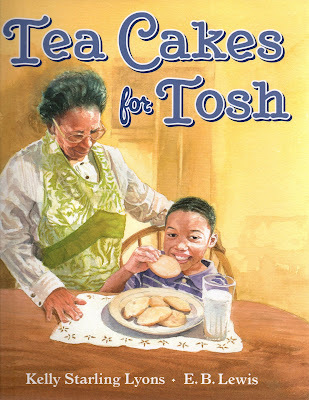 Black History Month seems like a fine time to share a terrific new children's book I came across recently, "Tea Cakes for Tosh" by Kelly Starling Lyons and E.B. Lewis. I've been meaning to do some research about why tea cakes are called tea cakes, and so this book was a must-read. 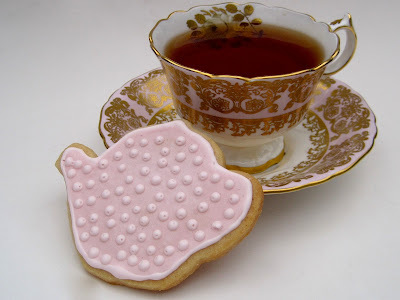 I had always assumed tea cakes were a specialty of the South, but it wasn't until a few years back that I began to read about their associations with black culture. In "Tea Cakes for Tosh," Lyons shares a sweet and simple tale about "Grandma Honey," a grandmother who shares tea cakes and their heritage with her grandson Tosh. She tells him how his great-great-great-great-grandmother Ida was enslaved, and Grandma Ida made the best tea cakes around. Ida was not supposed to share these cookies with her children, but some days she managed to slip a few in her pocket "to give the children a taste of sweet freedom." As the story continues, we find it's not just a story about black heritage, it's also a story about aging grandparents, and how one little boy learns to carry on that tea cake tradition thanks to time spent with his grandmother. I would be remiss if I did not mention that E.B. Lewis' watercolor illustrations are, well, exquisite. 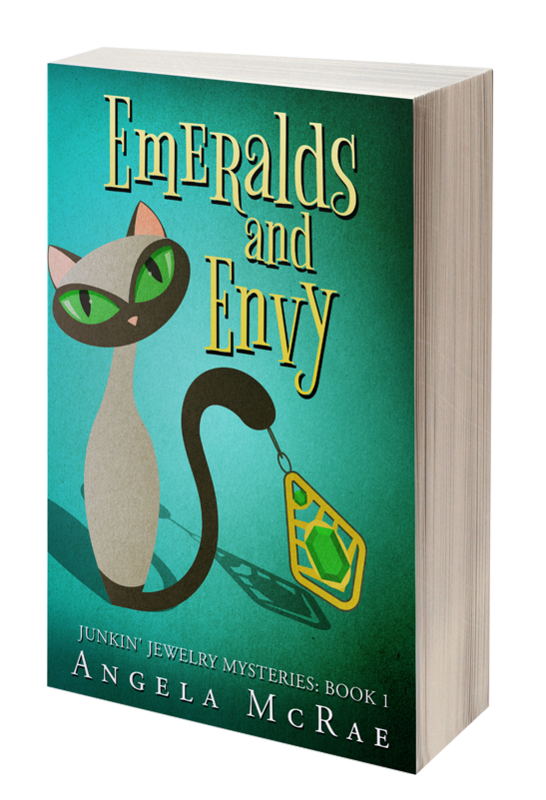 Most children's books I've read have that cutesy, cookie-cutter look to the characters, but this book's illustrations capture so well the characters in this story. I love how you can even see the texture of the watercolor paper in the book's illustrations, and I actually found myself pausing to linger over the illustrations of Honey, from her black curls and wrinkled hands to the bib-style apron she wore, just like the ones once worn by my own late grandmother. I don't often get inspired to Google the illustrator behind a book, but I did this one. His art combined with Lyons' compelling story made this just a truly heartwarming read. 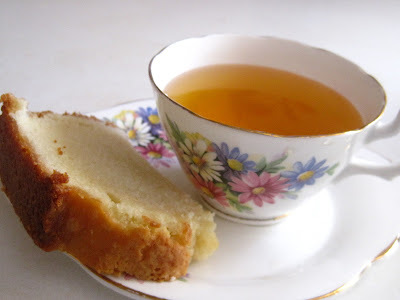 And yes, Grandma Honey's tea cake recipe is included at the end of the book! It helped immensely that I had already baked the cookies and had them in the freezer before the day's session began. Step one: mixing royal icing into piping consistency and outlining the cookies. That little glob at the bottom is the same thing I do when outlining crafts with Elmer's, so I will work on developing a steadier hand! 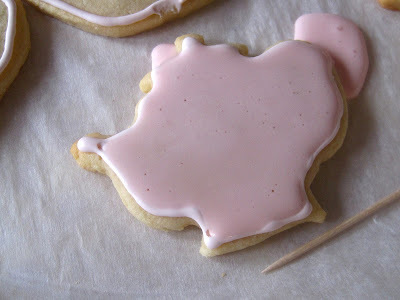 The next step was mixing the royal icing into flooding consistency. I flooded my cookie all right, and the first one breached the levee! Realizing I had gone a little icing crazy on that first effort, I tried a gentler hand, and this little guy turned out much better. Were they dry yet? I thought so, but those little indentations at right are where I stuck my finger in the wet paint. I realized I needed to take a side view of the cookies. These were still wet-wet-wet. But eventually they dried and I piped polka dots on them. Though I think maybe I put too many polka dots. 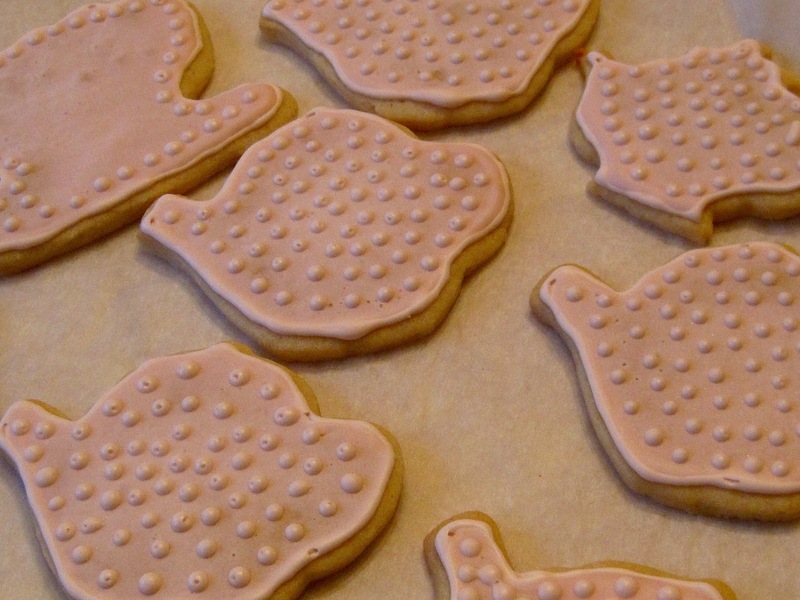 Do these cookies look like they have chickenpox to you? I'm not sure, but I think I'll space out the dots a little more next time. 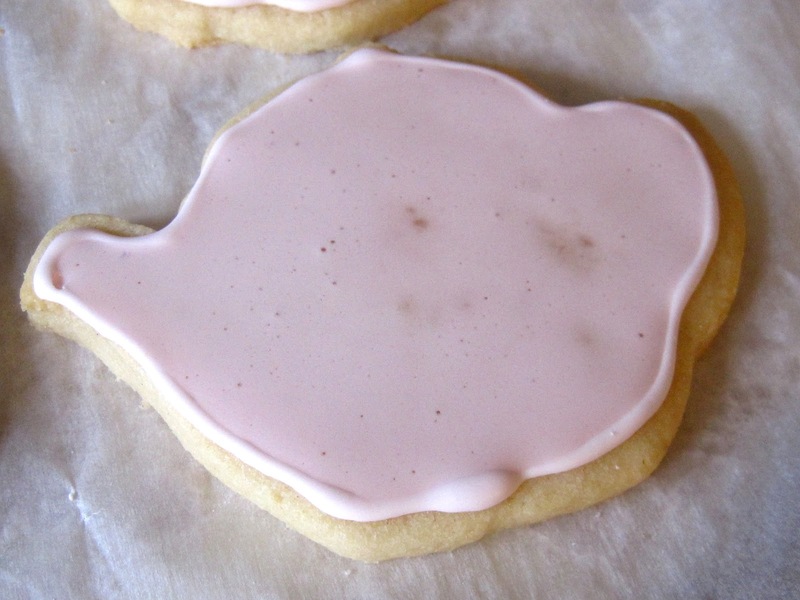 The happy news is that the cookies (including the icing!) 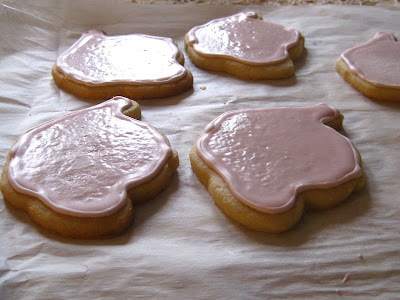 are delicious, I enjoyed my cookie decorating session, I learned a few things to improve upon for next time, and hopefully I'm well on my way to becoming a better cookie baker and decorator! 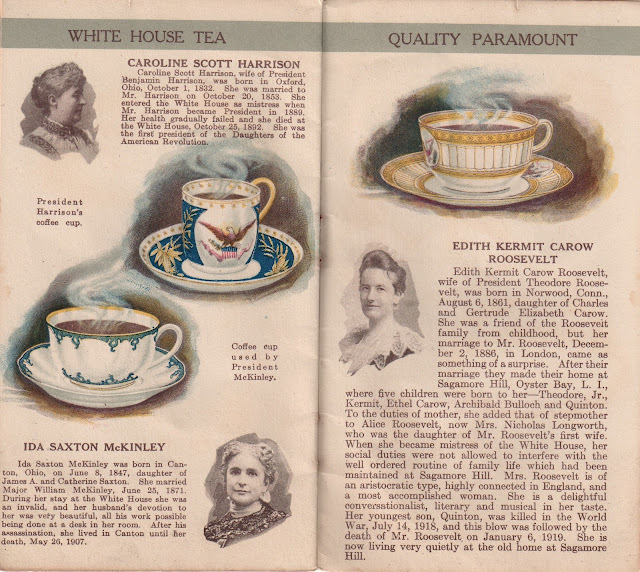 Decades ago I visited the lovely town of Eureka Springs, Ark., but unfortunately I wasn't yet into tea. 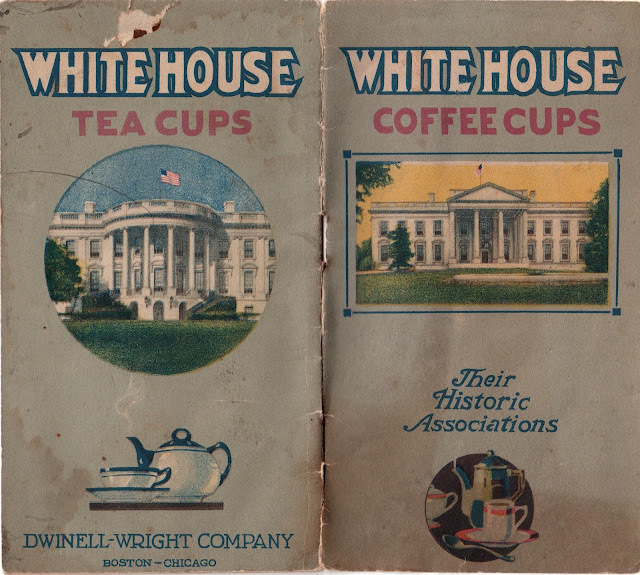 I was into antiques and travel, so of course a love for tea was just a matter of time. If I'd discovered that love of teatime earlier I could have enjoyed visiting quite a few tea rooms, like the Spears family's Victorian Sampler Tea Room that operated in Eureka Springs back then. 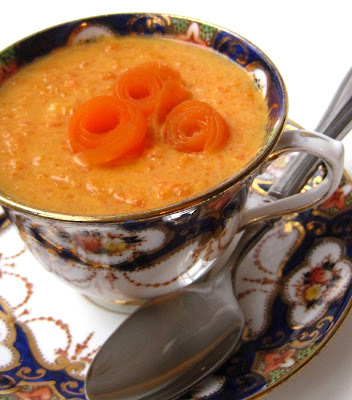 Copies of their cookbook still pop up online pretty frequently, and this Carrot Soup caught my eye since it was labeled "Most requested soup recipe in Tea Room." 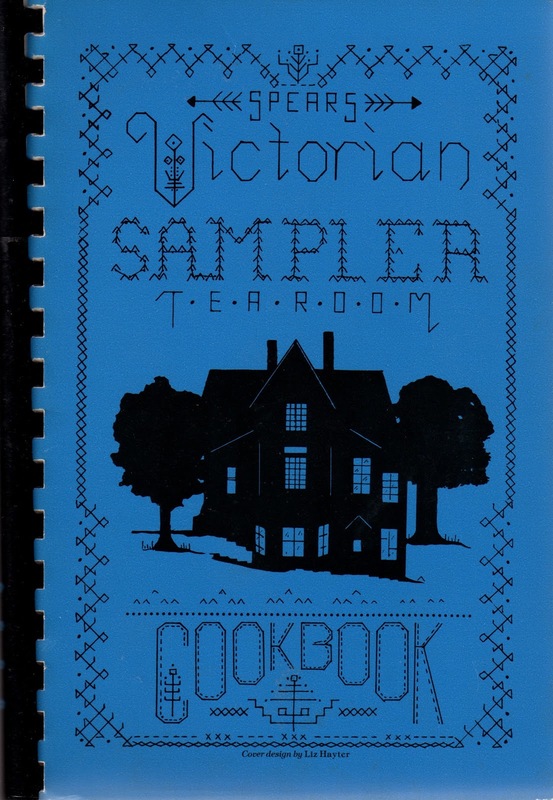 Ruth Spears wrote in the intro to this 1986 cookbook, "Jim and I purchased the Tea Room in late 1984. The home at 44 Prospect Street was built shortly after Eureka Springs' 1879 founding for one of the town's prominent physicians, Dr. C.F. Ellis." 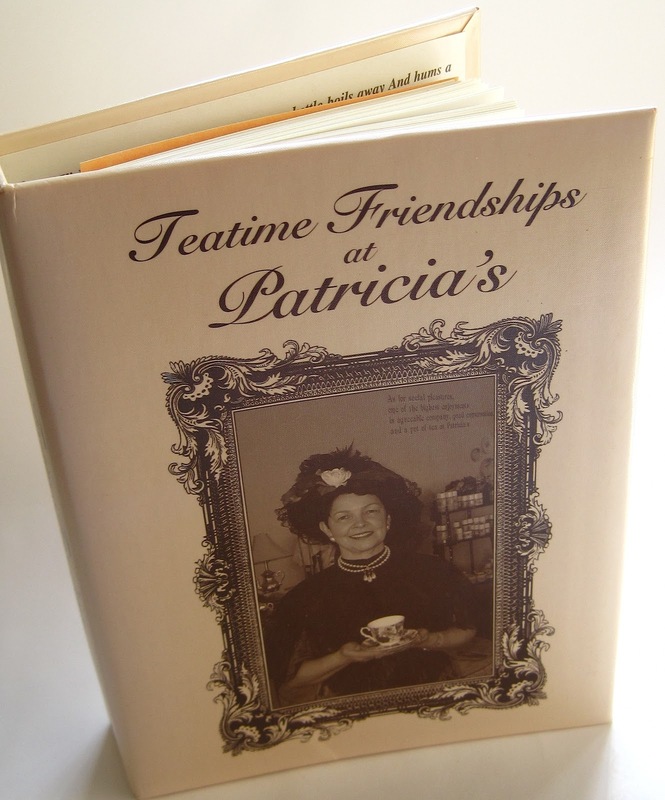 She and her husband ran the tea room with their daughter Lori, and this "book of favorites" includes recipes from family, friends and customers. Melt 2 tablespoons of the butter in a saucepan over medium heat. Stir in onions and cook for several minutes, until soft but not brown. Add carrots, chicken stock, tomato paste and rice. Simmer for 30 minutes. Puree the soup* until smooth, then season and stir in cream and remaining tablespoon of butter. Garnish with carrot curls. (Carrot curls can be made by shaving off thin strips of carrot with a vegetable peeler and forming them into rosettes.) Serves 6. *The book suggests you puree in a blender or food mill. Since I don't have either of those, I used my food processor, which was a little messy but I loved the result! At first, I was disappointed there were teeny-tiny specks of carrot instead of it being completely liquified. 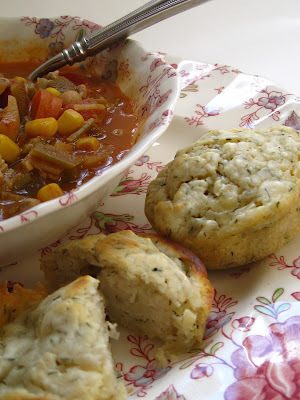 But once I took a bite, I liked it that way—and so did my husband! 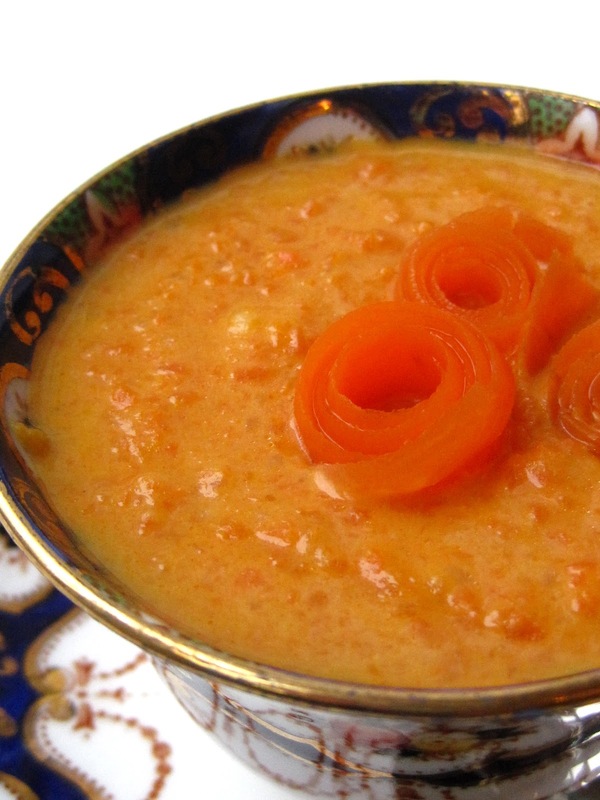 We both agreed this doesn't taste overly carrot-y, and that it perhaps deserves a name more exotic than simply Carrot Soup. He thinks it would be interesting to serve this to guests and have them guess what it is. 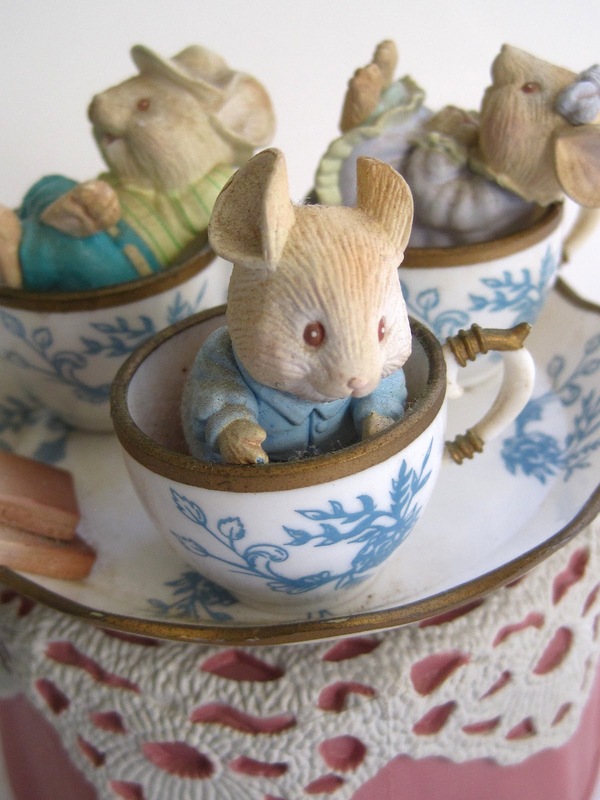 Served in teacups, this makes a fun presentation for the tea table—and just imagine the possibilities if you serve this in the fall! 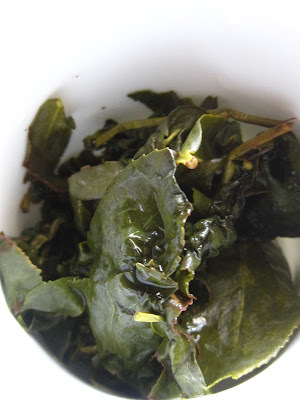 The latest of the Teavivre tea samples I've tried is their Jin Xuan Milky Oolong, what they describe as a "classic Taiwan oolong." 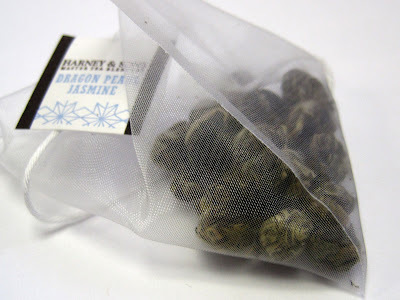 I do enjoy oolong teas, and the fun with this one came from the moment I opened the package and saw those tightly rolled little balls of tea. 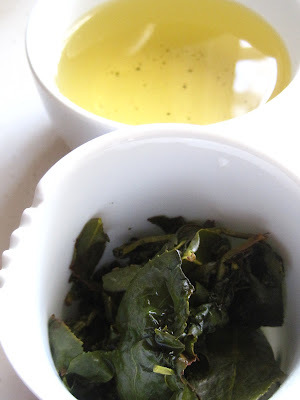 The tea leaves had a very crisp, fresh scent. After I steeped the tea in my tasting cup with boiling water for just about 2 minutes, I loved seeing how large the leaves had expanded! These were about 2-1/3 to 3 inches long, and I like seeing this with my tea, sometimes, as a reminder that tea really does come from a real live plant! 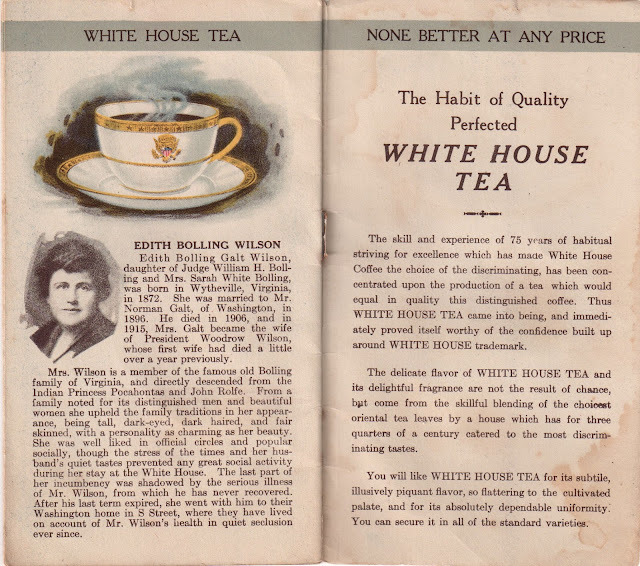 The tea had a lightly floral scent and a slightly vegetal taste which I very much enjoyed. But I have to say, the appearance of this tea was as enjoyable to me as its taste! 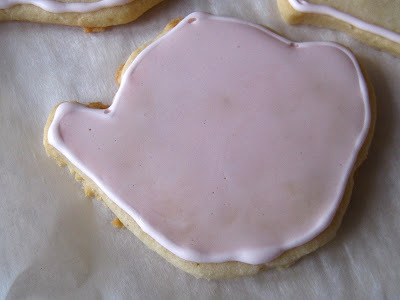 I guess I've been sipping lots of teabag teas lately, and even though they taste good, I can't say a teabag ever gives me the enjoyment of seeing the wet leaves as you see here. 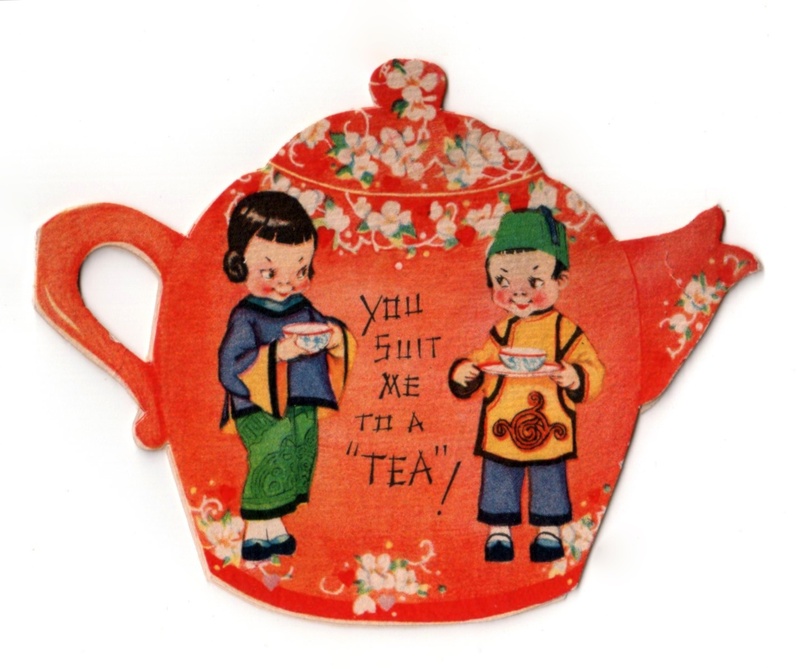 Do you get that way about your tea? Is it crazy to find beauty in a cup of wet tea leaves? 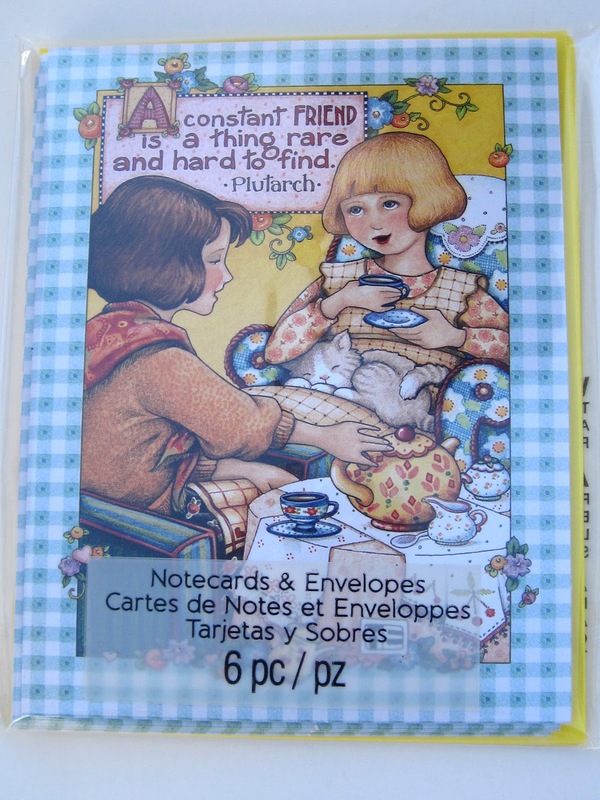 I always check out those cheapie bins at Michaels when I pay a visit to my local store, and this week those $1.50 goodies are on sale for $1, so I bought a few for my stash, including these Mary Engelbreit notecards and a notepad. 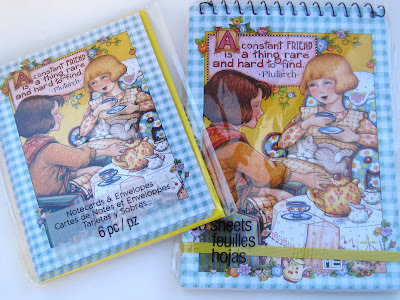 The design on these pieces is perfect for sending to tea friends, and it seems like I am forever sending notes in the mail, so these are great to have on hand. I also got the matching cupcake baking cups. There are also journals and pens in this design at my store, and somewhere (another tea blog?) I saw nail files, although my store didn't have those. What they did have, however, were some new designs of cupcake baking cups I think are absolutely gorgeous! 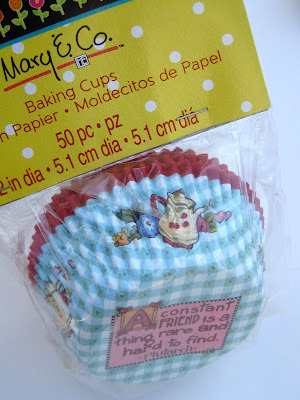 Do you use two at a time when you bake cupcakes? I've started doing that, because with one the batter bleeds through and the design doesn't show, but with two at a time, the outer one is all nice and pretty. 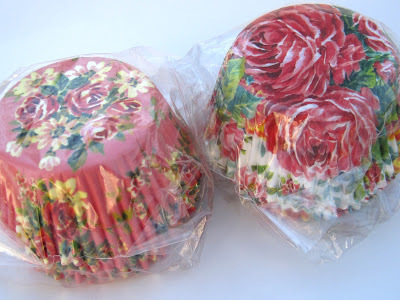 Someday, I'd love to have a huge stash of pretty cupcake papers so that every batch of cupcakes I make can look nice. And I will get there, a dollar or two at a time! 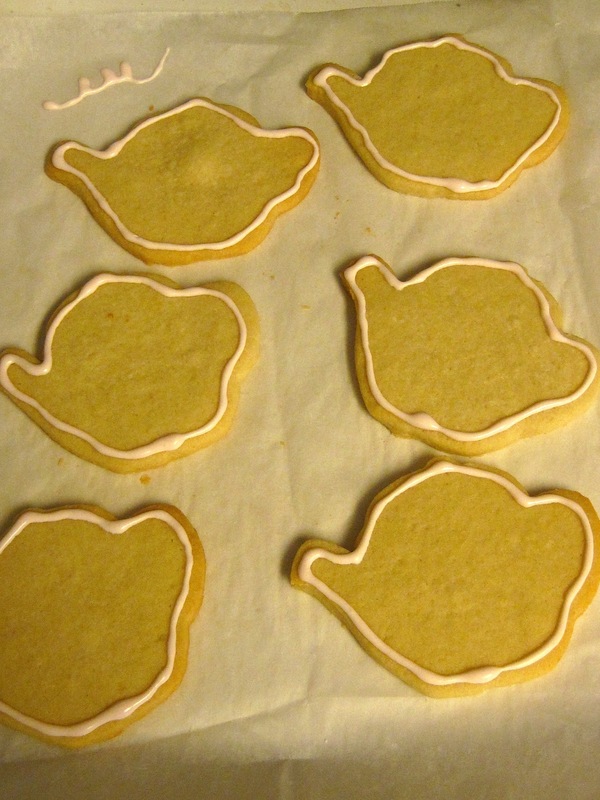 When it comes to tea and desserts, it seems to me that two foods are always, always correct: a good cookie and a good piece of cake. (Not necessarily at the same time, but hey, why not!) And I think the quintessential goes-with-everything type of cake is a Pound Cake, but I must confess, I've never much cared for most Pound Cake I've tried. Too plain. Too dry. In the Baskin Robbins of life, Pound Cake is plain vanilla. Or so I thought. 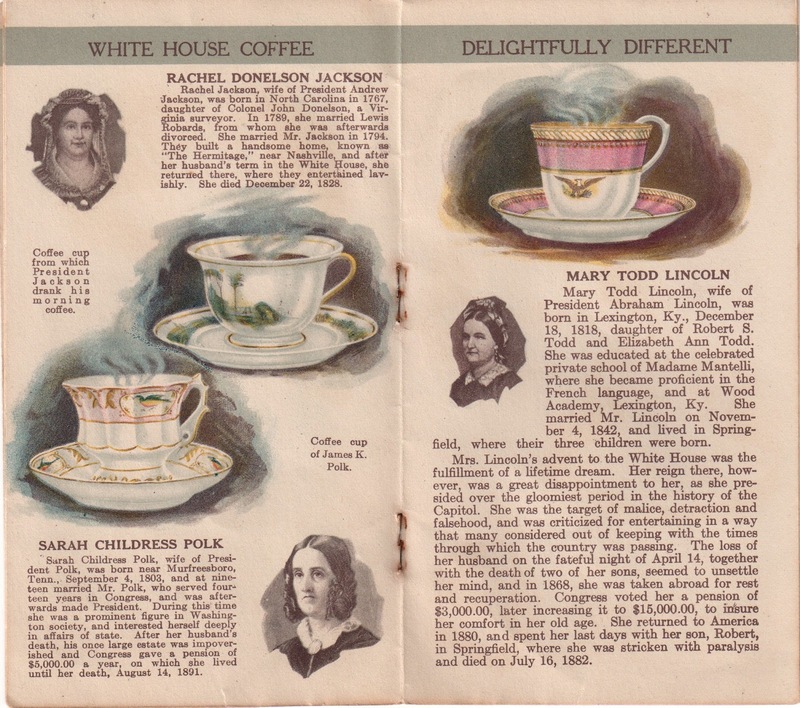 Back in the fall, I wrote about discovering Kathryn Crisp Greeley's fine book "The Collected Tabletop," which I absolutely adore for its emphasis on "collected, not decorated" tabletops and decor. The book included quite a few recipes as well, and I must tell you about one that is a real winner. It's the recipe for Greeley's grandmother's Caramel Cake, which a co-worker who borrowed my book made for the office luncheon at Thanksgiving. Ohhhh, was it ever good! Then I made the Caramel Cake, sheetcake style, for my family's Thanksgiving, and again, it was a huge hit. 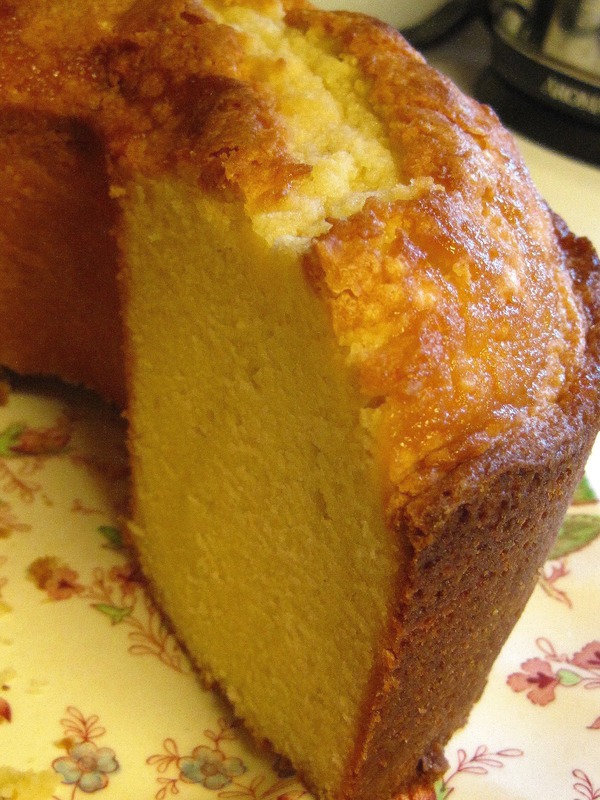 In fact, my parents liked the Caramel Cake but also said that they liked the cake part so much, they both thought that the cake alone would make a fine Pound Cake around Valentine's Day after all the holiday sweets had worn off. I was a little nervous about making the cake in this manner, but I tried it last week and it was awesome! Even after several days, it just seemed to get even more moist and tasty. That's not the sort of Pound Cake I'm used to! Here's the sample cake I made for me and the DH and behind it the gift cake I made for my parents. Greeley's recipe is online here, and the only adjustment I made is that I had to cook mine for about an hour when I made it in a tube pan. And see the cake carrier at back? 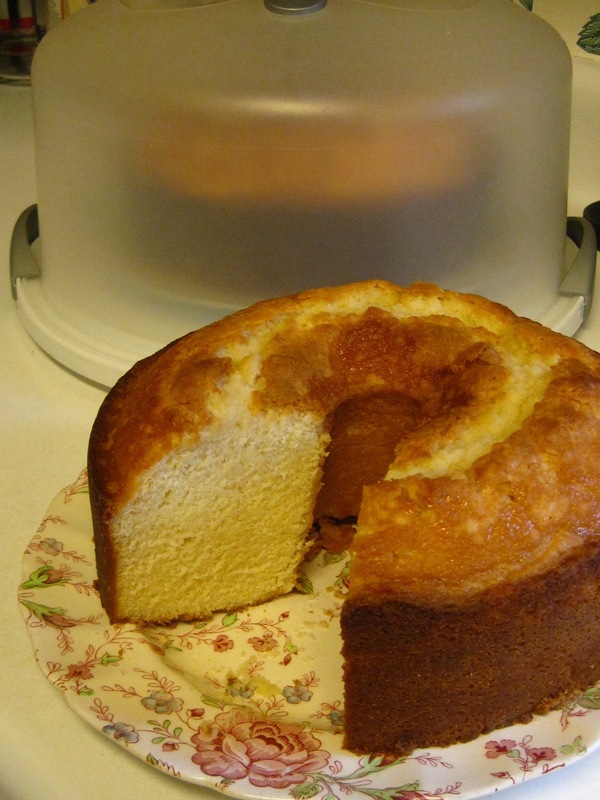 It's a simple $5 thing I found at Walmart a few years back and love because it has clasps on the base which hold the cake securely in place. My mom liked my new cake carrier so much, she went and bought one just like it. And so did my sister. Now, we all three have the same cake carrier, so when, for instance, I took my parents their cake over the weekend, my mom just handed me her empty cake carrier like this one to take back home and now we're both good to go. 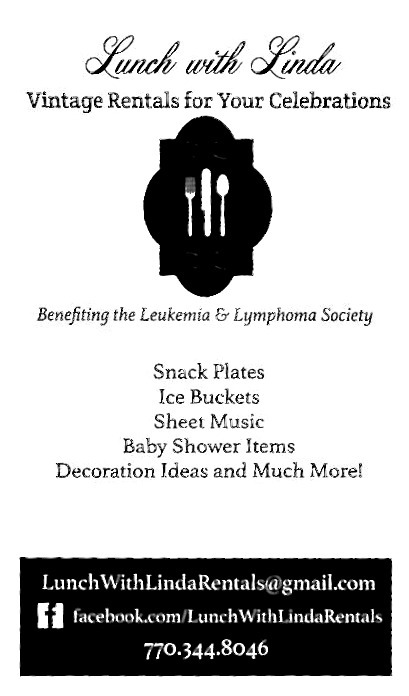 We never worry about who has whose cake carrier because they're all just alike! After surviving another magazine deadline at work last week, it was nice to relax by hitting the antique mall and some T.J. Maxx stores with my mom and aunt over the weekend. This time I came home with a new "tea shirt" (one of mom's thrift store finds), as well as a tiny little three-tiered silver server and a collectible I'd been wanting, a teatime music box! My Enesco music box was $8, and I think it is absolutely adorable. The little mice in their teacups rotate along as the music box plays. And what does it play? 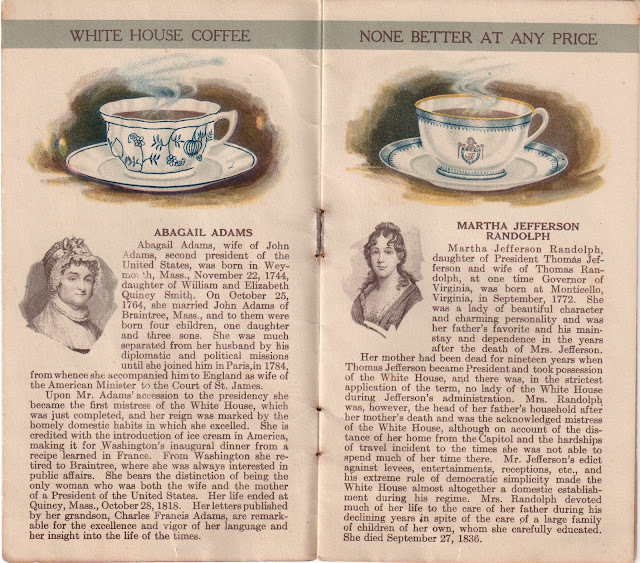 "Tea for Two," of course! 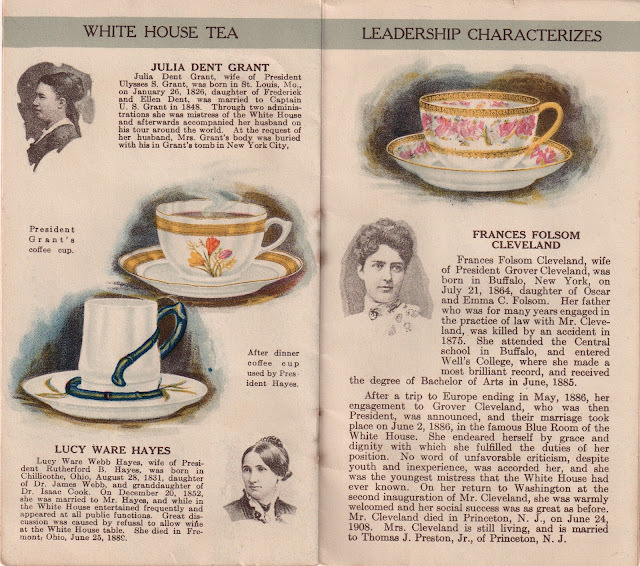 Since it's Presidents Day today, I thought this would be a good time to share a vintage booklet I found featuring the tea cups and coffee cups favored by some past presidential administrations. 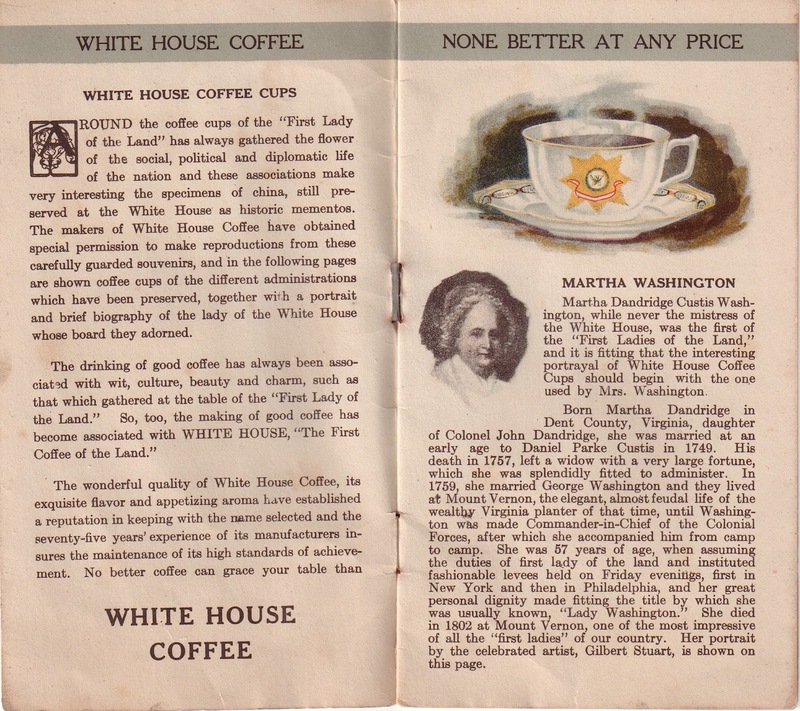 The booklet promotes the brands of White House Coffee and Tea, and it also profiles the first ladies through Edith Wilson, who was first lady from 1915-1921. 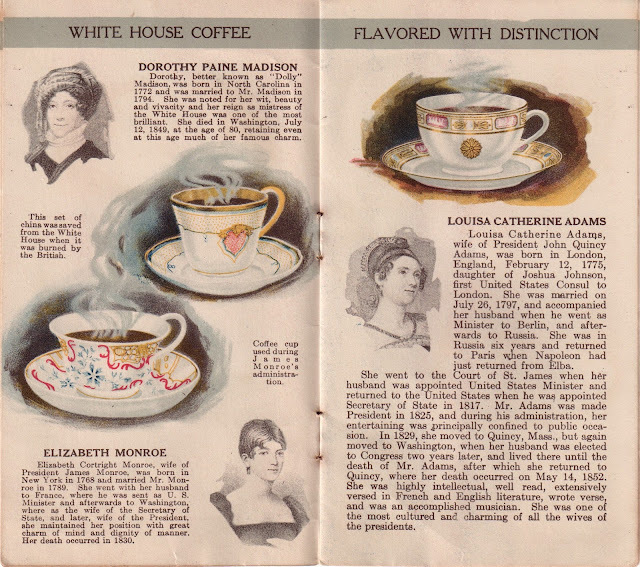 I'd love to know if you have a favorite cup after skimming through the pages below. I do--and I'll tell you my choice tomorrow if you'll tell me yours today! One time, I stopped by a friend's house at the dinner hour and found her family was eating the yummiest little sour cream muffins. 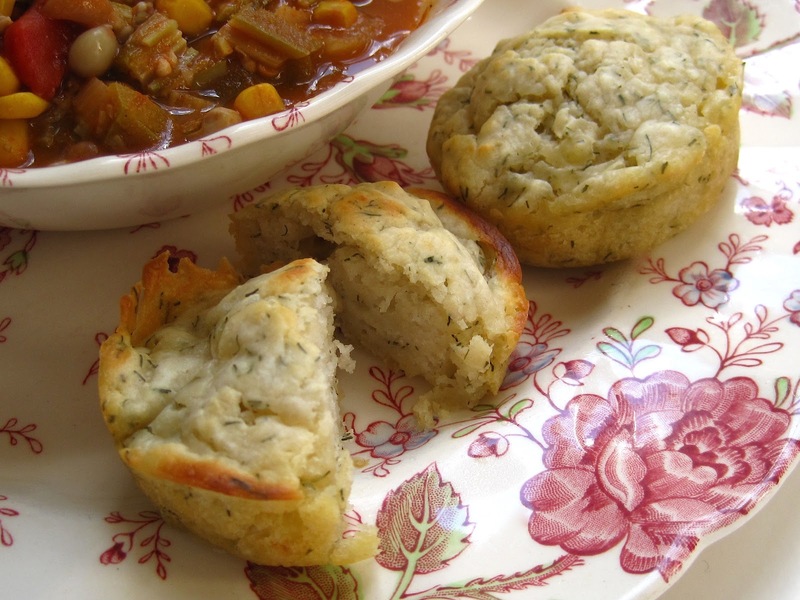 They required only a couple of ingredients and were really more like biscuits, only in the shape of flat little muffins. For this week's recipe, I wanted some sort of bread that would be a good accompaniment to a big pot of vegetable soup I had made. 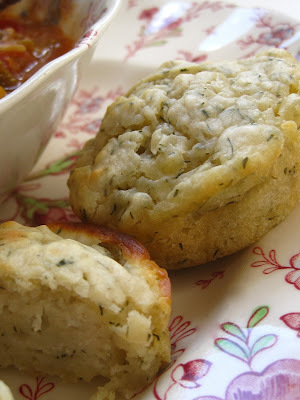 When I found a tea room recipe for Dill Muffins similar to those my friend had made, I knew this was what I wanted to make, and it couldn't have been easier! 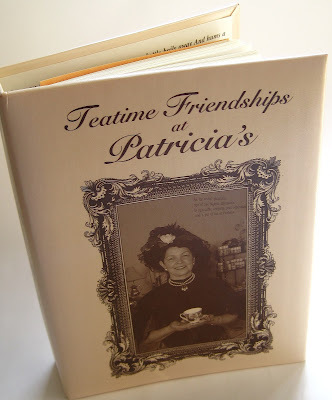 The recipe comes from "Teatime Friendships at Patricia's," a three-ring notebook of recipes I bought online several years ago. 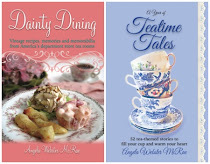 It includes lots of traditional teatime fare, and I especially enjoyed seeing the photos of tea room owner Patricia Shell and her friends wearing Victorian dresses and bearing teacups. 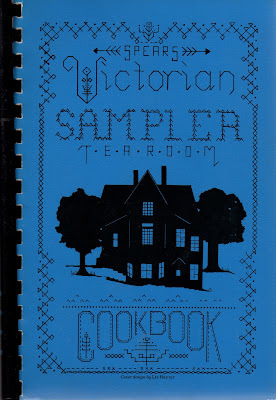 Since this Missouri tea room has now closed, I'm happy I at least got to visit it in the pages of this cookbook! And now here's the super easy recipe. Preheat oven to 350 degrees. Blend all ingredients and fill muffin tins sprayed with cooking spray 1/2 full. Bake 20-22 minutes, just until edges are starting to turn golden. Yields 12 delicious, flat little muffins, spongey in texture. I think these would be great sliced in half and used as tea sandwich bread, and this recipe would also make excellent mini muffins! Nancy G.! 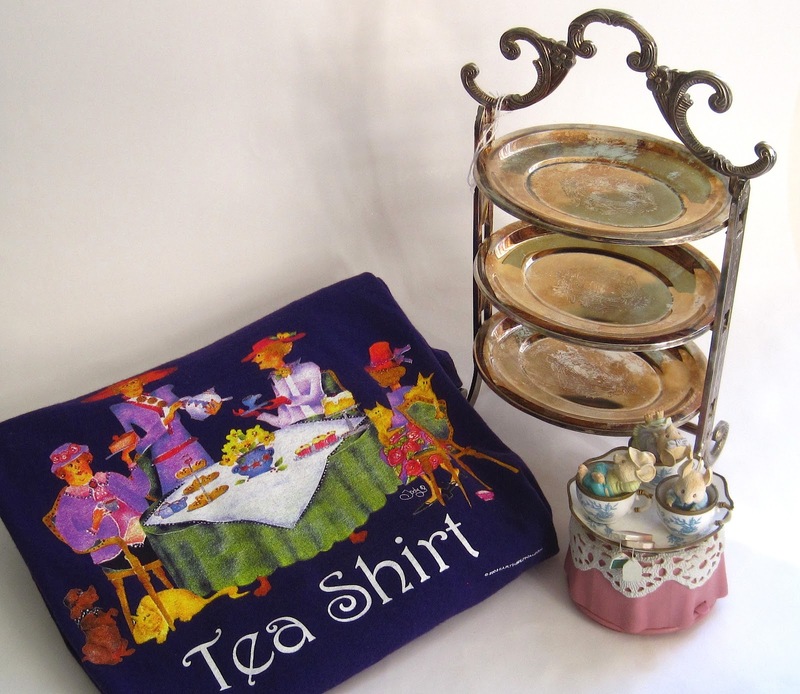 If you'll send me your snail mail address via the e-mail button at right, I'll get the new tea towels headed your way. Congrats! When I was out looking for little trinkets to give away over Valentine's Week this year, I must confess I did buy something for myself. 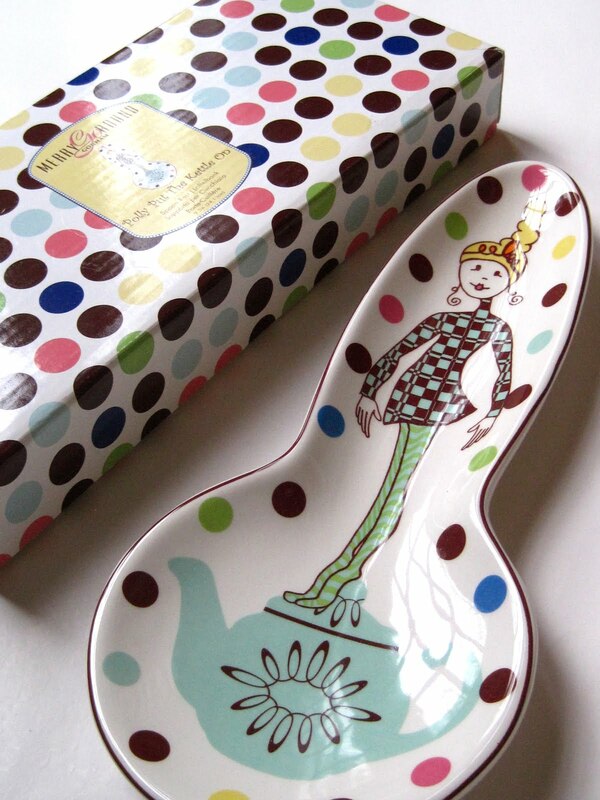 I had actually passed by this polka dotted box at T.J. Maxx many times, but then one day I saw it said "Polly Put the Kettle On" and whatever the spoon rest inside looked like, it was just $3. 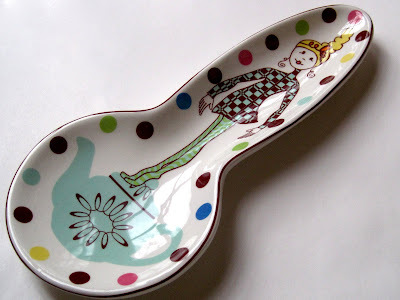 Interestingly, I have actually *needed* a spoon rest! When I'm cooking spaghetti or something with a messy sauce, I use vintage rose dishes to hold the spoons, and I'm forever staining them, which isn't good. This $3 piece, I don't think I'll mind messing up! And of course a cute teapot graphic never hurts! ... Tina Gross! Tina, if you'll send me your snail mail address via the e-mail button at right, I'll get this soap headed your way. Congrats! Happy Valentine's Day, friends! I can't believe the day is here already—I feel like I just got started sharing vintage Valentines and giveaway treats! 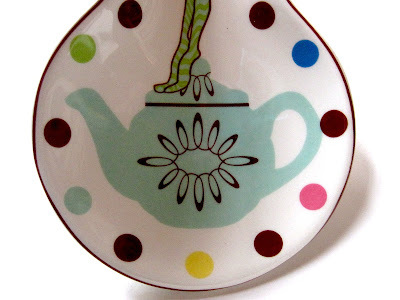 Today I'll end with one of my favorite Valentine acquisitions of the last year, this red teapot design. The inside says, Does "oo-long" for me? The grammar needs a little work, but the message is cute as can be! And since today is the last day I'll be sharing tea-themed Valentines this year, I wanted to answer a couple of questions I was asked about them. 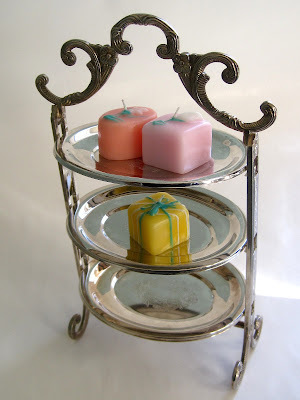 First, Mary Jane wanted to know, how do I display them? Well, I must confess that until that question, it had not occurred to me to display them! I keep them all filed in a little photo storage box, and I just wanted them for crafting and graphics inspiration. Now, though, I'm thinking maybe I'll be on the lookout for a nice collage frame and display new ones each year. Phyllis asked if I knew how many I have. Yes, 43. My goal is to find at least seven new ones each year so that I'll be set for the following year's Valentine's giveaways on this blog. You'll be happy (I hope!) to know that I've already got enough to do another week of posts next year! And I should mention that there are still plenty of tea-themed Valentines I do not have, but I like to get them for under $5 (with a few exceptions) and am willing to wait years to get them at a bargain price. Makes the hunt more fun! And as our last giveaway for Valentine's Week 2013, I hope you won't think I'm nuts for offering two "Easter" tea towels, but when I saw these at T.J. Maxx I thought they'd be perfect for one of you! 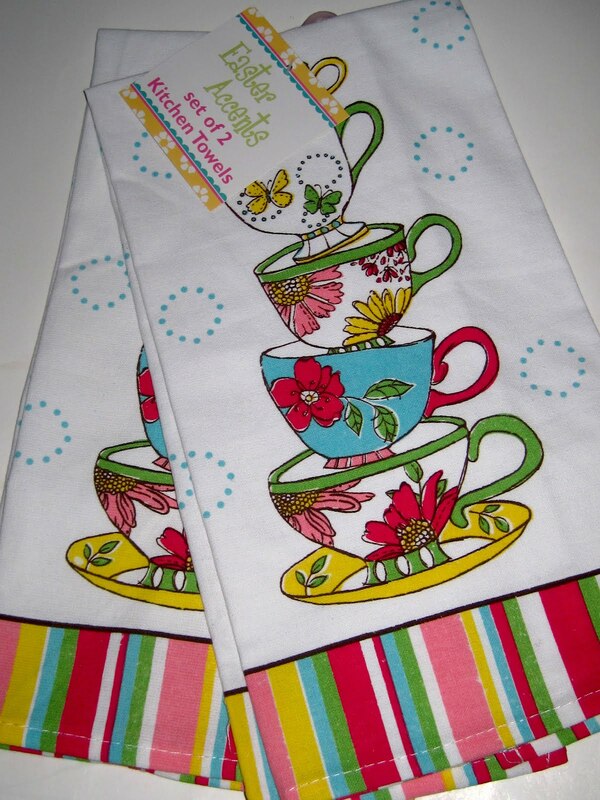 Besides, I don't see any Easter eggs or bunny rabbits on these tea towels, just a cute, cheerful design of teacups. The two tea towels are exactly alike, so you'll have one to keep and one to give away if you're so inclined. If you'd like to win them, just leave an "Enter me" to this post between now and 7 a.m. EST tomorrow. Hope you all have a very, very Happy Valentine's Day!